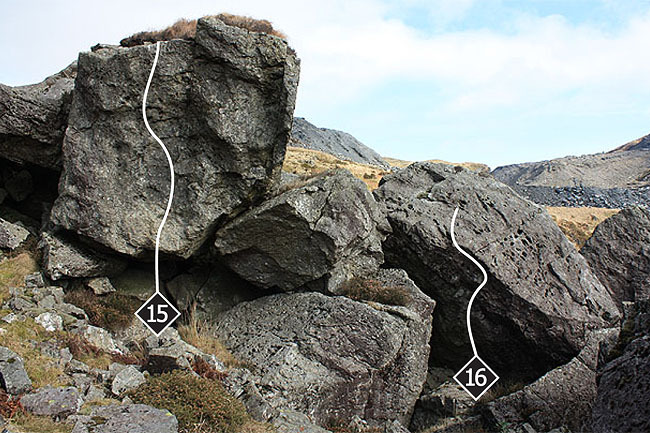 Just above the Blaenau town centre, perched atop a steep incline, is a superb bouldering venue. In truth it is two little areas sited right next to each other. The quarried walls of the Sidings provide some fine vertical problems on pockets and thin edges. The landings are good but typically a bit squelchy so pads are essential to keep feet dry. Just over the back from the quarried cutting there is the Trefeini boulder field. 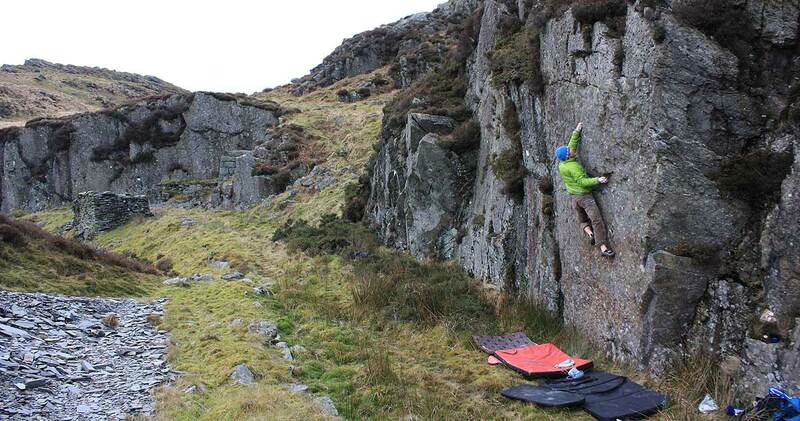 This jumble of large blocks sits on a marshy plateau edged by some small route crags. The problems here are quite different in character, being generally steeper and more powerful. Some of the lines are really classic and there is potential for harder ones to be developed. The two large blocks on the left edge of the boulder field have good landings, however within the boulder field itself things are less friendly. A team visit with lots of pads is recommended; lone boulderers should take care. 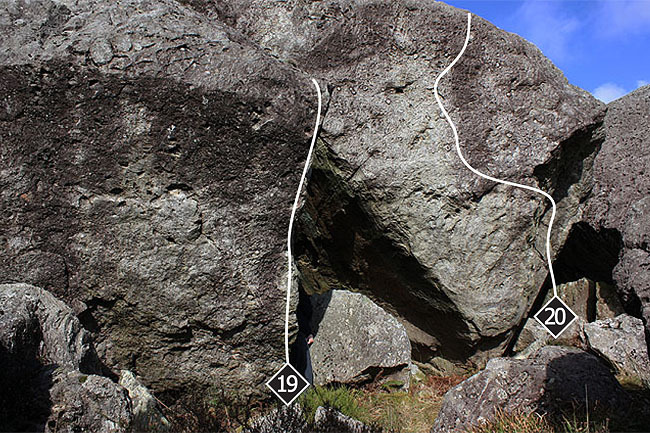 The rock is generally very good quality, offering a wide variety of holds and many pockets. Conditions: Both the quarried cutting and the boulders have a sunny aspect and dry fairly quickly after rain. Some of the pockets in the boulders hold dampness after rain and the shady faces tend to be a quite lichenous and damp. The plateau is fairly exposed to the wind which helps to keep any excessive dampness at bay. Inevitably on still summer evenings the midges congregate to buzz and feast upon human visitors. Approach: From the main town centre road turn up by the Co-op shop and follow the Dolgaregddu Street past the police station. Turn left onto Lord Street and follow this up the hill to a gate. There is some parking space in this area but be sure not to block the gate. 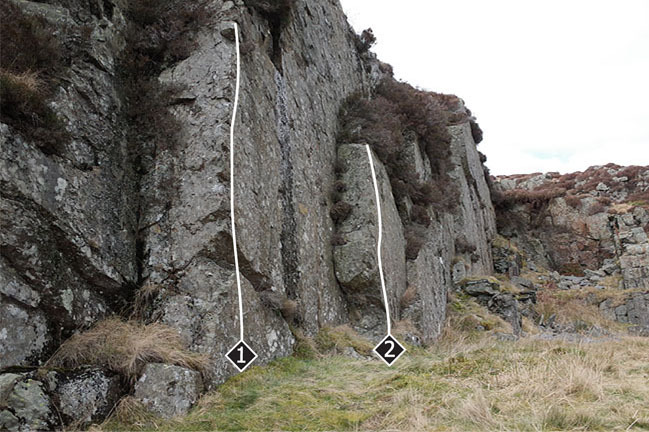 There are two possible approaches; the steepest and most direct goes up the grassy hillside above the small pull in on the left and then follows the incline up right to the quarried cuttings of the Sidings. For a longer, gentler route walk up the track beyond the gate at the end of the road until you reach a level area. Cut back left along the top of a slate spoil ridge and the Trefeini boulders will soon come into view on the right, while the Sidings can be reached by walking straight ahead. Layback up the arête to reach some good holds. Topping out is not recommended so climb down and jump back onto your pad. It is possible to force a fingery line up the wall to the right but this lacks a defined finish. The undercut arête a short distance to the right of Problem 1 is harder than it looks. Finish at the obvious jugs. Down and right of the large wall there is a small arête which gives a very easy problem. 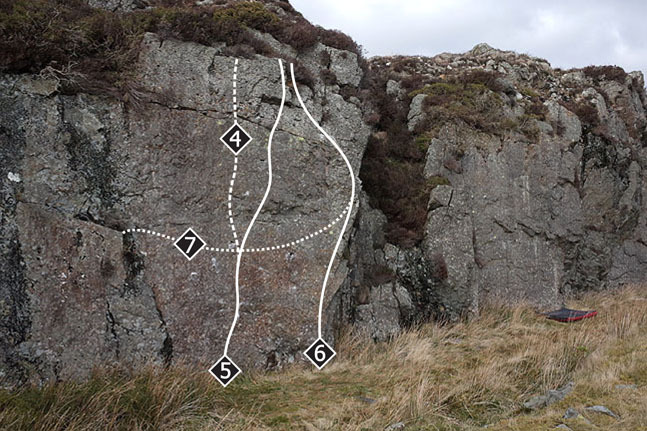 The next significant lines can be found on the left hand end of the cutting walls. Gain the quartz v-groove and top out directly. A few scruffy lines can be climbed to the left but the obvious loose-looking ledge is best avoided. 8m to the right is a clean pocketed wall. Al, the lines top out but it is less trouble to traverse right on the juggy ledges and down climb/jump off the right arête. Climb straight up the wall taking the horizontal pocket on the upper wall with your right. 6B from the Pigo Pocad crouching start. 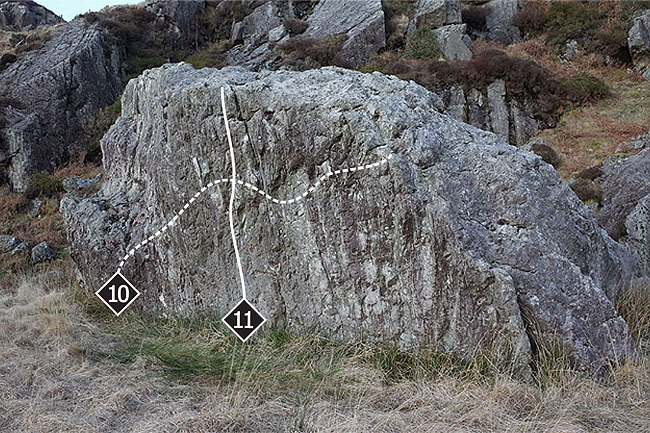 A fine problem with a distinctive crux. Climb up the wall taking the horizontal pocket on the upper wall with your left. There is a good 6B crouching start. The right arête of the wall is very good; finish leftwards up the juggy ledges. Start at the flake on the left and traverse rightwards across the base of the wall to finish up the arête of Problem 6. A nice flowing line. 6m to the right there is another clean wall. A thin test piece. Pick your way up the wall, finishing rightwards to the juggy ledge. The crouching start bumps the grade up to 6B. 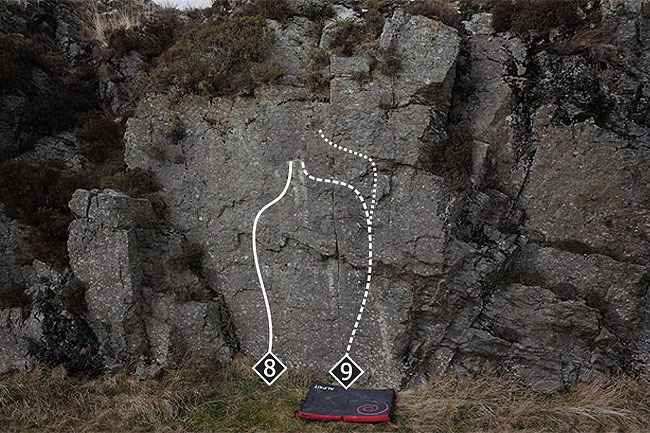 Move up past the diagonal bore hole then break left to gain the same finishing ledge on Problem 8. A higher finish is possible going up to the top ledge. 6m to the right there are a couple of minor problems with some suspect rock; a 4C climbing the pillar just left of a small corner and a 5A tracing a diagonal leftwards along the lip of the steepness on the right side of the small corner. Neither problem tops out; reverse or jump (carefully) down from the obvious jugs. Standing alone on the left is a steep-faced boulder. 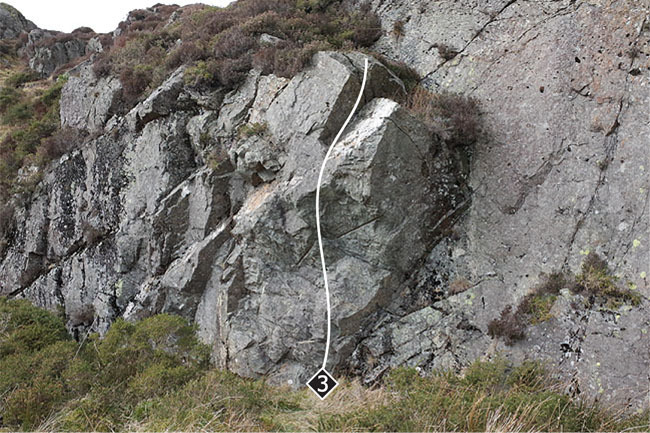 An absorbing and pumpy traverse of the steep wall; start low on the left and traverse rightwards, rising up slightly to the good flake. Stay at this level then drop down slightly for the crux section before finishing out right on good holds. An easier and less satisfying version moves up to good holds near the top of the wall. The central sds line on steep wall. 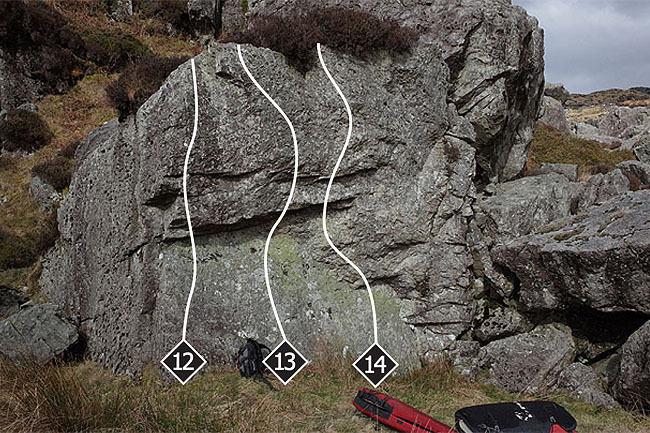 A couple of hard moves lead into easier climbing; alternatively, link into the traverse for a tougher challenge. 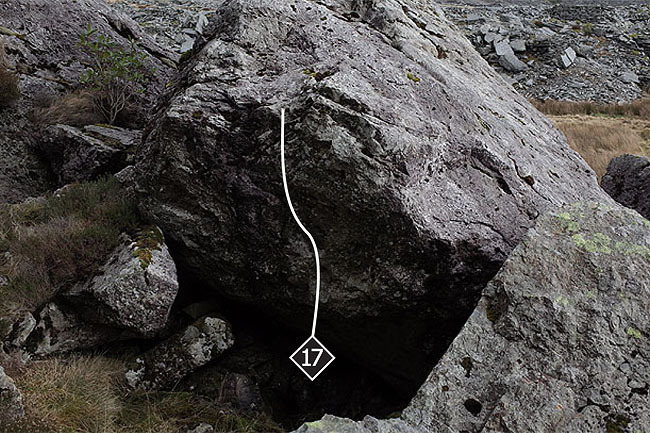 On the left side of the main boulder field there is a bulging face with a horizontal overlap. The central line on the bulging face is superb. Start standing down to the right with a right hand two finger undercut. Gain another two finger undercut up left in the overlap then power up through the bulge. Finish with a good lip jug and a wriggle through the ‘moustache’. The right hand groove can be climbed but it lacks definition and has a bad landing. On the edge of the central section of the boulder field is an attractive undercut face. After an awkward start move up past an obvious pocket to a mantel finish. Obvious sit down start line 4m to the right. 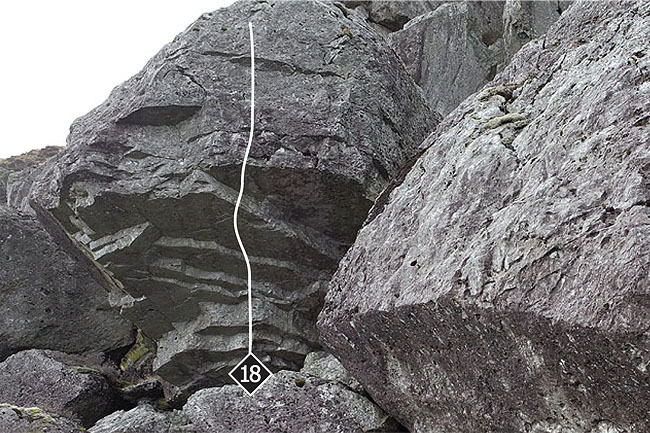 Slap out to the slopey lip, re-adjust to a useful pocket then climb up and rock out rightwards onto the slab. Up above Hogleuon Personol there is a steep little line emerging from a pit. Start sitting as low as you can and power upwards. Round to the right in the centre of the boulder field is a large stepped roof. The right hand line on the roof is good but needs some care with the landing. Other lines are possible to the left but the landing is poor. 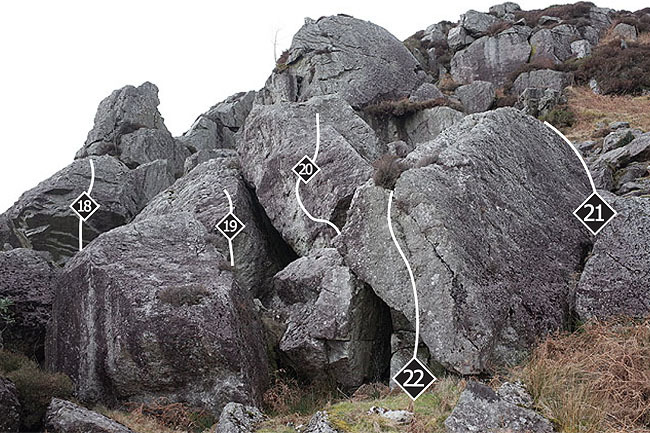 To the right the two large, steep sided boulders provide some excellent problems. The right side of the boulder field is dominated by a huge slabby boulder. At the top end of this there is a steep little facet. Climb the steep arête on its right side from a sit down start. 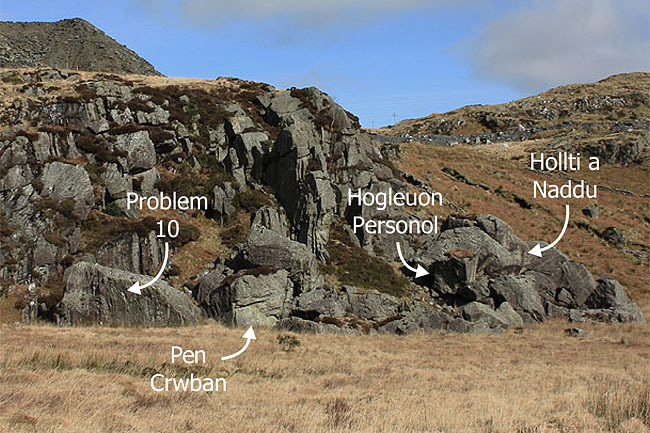 Down at the bottom end of the huge slabby boulder there is one more worthwhile problem. Gain the blunt flake and climb up to the heather tuft on top; easier if you drift onto the right arête.